WASHINGTON, D.C. -- The unemployment rate declined from 7.3 percent to 7.0 percent in November, and total nonfarm payroll employment rose by 203,000, the U.S. Bureau of Labor Statistics (BLS) reported today. Employment increased in transportation and warehousing, health care, and manufacturing. Both the number of unemployed persons, at 10.9 million, and the unemployment rate, at 7.0 percent, declined in November. Among the unemployed, the number who reported being on temporary layoff decreased by 377,000. This largely reflects the return to work of federal employees who were furloughed in October due to the partial government shutdown, BLS says. Among the major worker groups, the unemployment rates for adult men (6.7 percent), adult women (6.2 percent), teenagers (20.8 percent), whites (6.2 percent), blacks (12.5 percent), and Hispanics (8.7 percent) changed little in November. The jobless rate for Asians was 5.3 percent (not seasonally adjusted), little changed from a year earlier. The number of persons unemployed less than 5 weeks declined by 300,000 in November, partially reflecting the return to work of federal employees on furlough in October. The number of long-term unemployed (those jobless for 27 weeks or more) was essentially unchanged at 4.1 million in November. These individuals accounted for 37.3 percent of the unemployed. 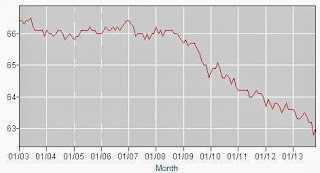 The number of long-term unemployed has declined by 718,000 over the past 12 months. The civilian labor force rose by 455,000 in November, after declining by 720,000 in October. The labor force participation rate changed little (63.0 percent) in November. Total employment as measured by the household survey increased by 818,000 over the month, following a decline of 735,000 in the prior month. This over-the-month increase in employment partly reflected the return to work of furloughed federal government employees. The employment-population ratio increased by 0.3 percentage point to 58.6 percent in November, reversing a decline of the same size in the prior month. The number of persons employed part time for economic reasons (sometimes referred to as involuntary part-time workers) fell by 331,000 to 7.7 million in November. These individuals were working part time because their hours had been cut back or because they were unable to find a full-time job. In November, 2.1 million persons were marginally attached to the labor force, down by 409,000 from a year earlier. (The data are not seasonally adjusted.) These individuals were not in the labor force, wanted and were available for work, and had looked for a job sometime in the prior 12 months. They were not counted as unemployed because they had not searched for work in the 4 weeks preceding the survey. Among the marginally attached, there were 762,000 discouraged workers in November, down by 217,000 from a year ago. (The data are not seasonally adjusted.) Discouraged workers are persons not currently looking for work because they believe no jobs are available for them. The remaining 1.3 million persons marginally attached to the labor force in November had not searched for work for reasons such as school attendance or family responsibilities. Total nonfarm payroll employment increased by 203,000 in November. Job growth averaged 195,000 per month over the prior 12 months. In November, job gains occurred in transportation and warehousing, health care, and manufacturing. Employment in transportation and warehousing rose by 31,000 in November, with gains in couriers and messengers (+9,000), truck transportation (+8,000), warehousing and storage (+5,000), and air transportation (+3,000). Health care employment continued to increase over the month (+28,000). Job gains occurred in home healthcare services (+12,000) and offices of physicians (+7,000), while nursing care facilities lost jobs (-4,000). Job growth in health care has averaged 19,000 per month thus far this year, compared with an average monthly gain of 27,000 in 2012. In November, manufacturing added 27,000 jobs. Within the industry, job gains occurred in food manufacturing (+8,000) and in motor vehicles and parts (+7,000). In November, employment in professional and business services continued to trend up (+35,000). Over the prior 12 months, the industry added an average of 55,000 jobs per month. Retail trade employment also continued to expand in November (+22,000). Within the industry, job growth occurred in general merchandise stores (+14,000); in sporting goods, hobby, book, and music stores (+12,000); and in automobile dealers (+7,000). Over the prior 12 months, job growth in retail trade averaged 31,000 per month. Within leisure and hospitality, employment in food services and drinking places continued to trend up in November (+18,000). Job growth in this industry averaged 28,000 per month over the prior 12 months. Employment in construction continued to trend up in November (+17,000). Monthly job gains in the industry averaged 15,000 over the prior 12 months. Federal government employment continued to decline (-7,000) in November. Over the past 12 months, federal government employment has decreased by 92,000. Employment in other major industries, including mining and logging, wholesale trade, information, and financial activities, showed little or no change in November. The average workweek for all employees on private nonfarm payrolls edged up by 0.1 hour to 34.5 hours in November. The manufacturing workweek edged up by 0.1 hour to 41.0 hours, and factory overtime edged up by 0.1 hour to 3.5 hours. The average workweek for production and nonsupervisory employees on private nonfarm payrolls edged up by 0.1 hour to 33.7 hours. In November, average hourly earnings for all employees on private nonfarm payrolls rose by 4 cents to $24.15. Over the year, average hourly earnings have risen by 48 cents, or 2.0 percent. In November, average hourly earnings of production and nonsupervisory employees increased by 3 cents to $20.31. The change in total nonfarm payroll employment for September was revised from +163,000 to +175,000, and the change for October was revised from +204,000 to +200,000. With these revisions, employment gains in September and October combined were 8,000 higher than previously reported.